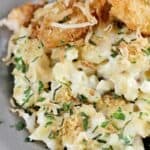 Coconut shrimp and macaroni and cheese, together in this creative delicious recipe. Put the pasta to cook to al dente according to package directions. In medium saucepan, heat the butter and flour over medium heat whisking until smooth. Cook two minutes at a gentle simmer. Slowly whisk in the milk and coconut milk. Heat, stirring constantly, until just hot but not simmering. Remove from the heat. Whisk in the mustard and salt, then add the cheese. Add the cooked pasta and pour all into a 13x9 baking dish. Combine the 1/2 tablespoon olive oil with the breadcrumbs; sprinkle over the casserole. Bake at 350F for 20 minutes or until nice and bubbly. Meanwhile, layer the coconut flakes on a bake sheet. Bake in the oven at 350F until browned and toasty. Once the macaroni and cheese is done, remove from the oven and set aside. Raise the temperature of the oven and cook the shrimp according to package directions. Serve the macaroni and cheese topped with coconut shrimp and coconut flakes. Garnish with chives and parsley. If you have two ovens (I don't), the coconut shrimp can be cooked while the macaroni and cheese is cooking to save some time. You may have to stir the coconut flakes mid-way while cooking because the ones around the outer edges will brown faster.